Trust in Swagelok to help deliver and meet your special alloys needs. We have the industry knowledge, metallurgy expertise, quality reputation, layers of support, and skills in both design and manufacturing to assist with your job requirements. Choosing the right alloy can be a daunting task. At Edmonton Valve, we can help streamline the process of finding, specifying, and ordering special alloy products. 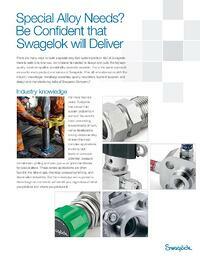 Fill the form to download Swagelok's Special Alloys PDF.